The Dodgers have a lot of pitching depth in their system. On Opening Night, Dustin May showed a sample of just how good it is. MLB.com's No. 68 overall prospect allowed two hits and struck out nine over five scoreless frames. May walked one and hit a batter, but didn't factor into the decision as Double-A Tulsa eventually fell to Arkansas, 6-4, in 10 innings. After earning a promotion from Class A Advanced Rancho Cucamonga to the Texas League midway through 2018, May picked up right where he left off. As a 20-year-old, May posted a 2-2 record with a 3.67 ERA and 28 strikeouts through six games. Over the spring, the Dodgers No. 3 prospect gave up just one earned run in nine innings of Cactus League action. In his first outing of the 2019 season, he gave up an infield single in the first inning to fourth-ranked Mariners prospect Evan White and plunked Chris Mariscal to lead off the second. May ran into some trouble in the third after allowing a leadoff single by Joseph Odom and walking Aaron Knapp with nobody out. The right-hander responded by striking out Seattle's No. 14 prospect Jake Fraley, White and seventh-ranked Kyle Lewis. "You have to bear down and try to get outs as quick as you can," May said. "In my head, I was thinking ground-ball double play, but three strikeouts is not bad. I feel like that was when the game turned in my favor. They didn't do much after that." May retired the next six batters straight, four via the strikeout, to cap off his first Opening Night performance of his career. "I thought (tonight) went pretty good," May added, noting he had solid command of his fastball, cutter and changeup throughout the game. "No nerves, just the anticipation of going out. I was really excited to get the first one under the belt. ... It was definitely a lot of fun to get out there and start the season out, for me, the right way." 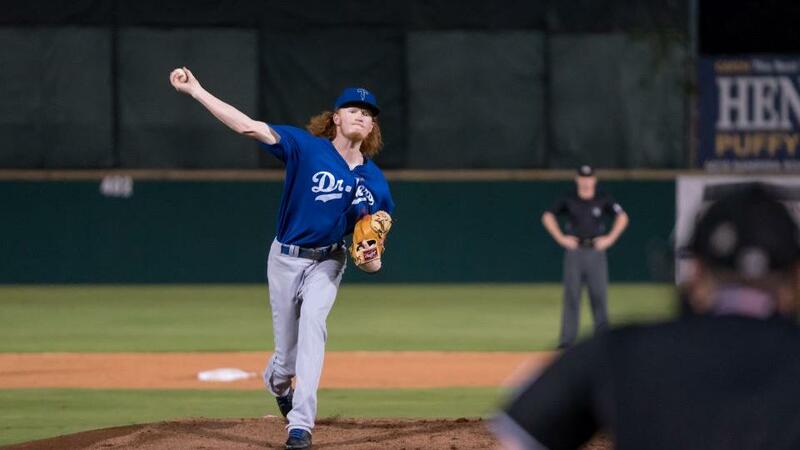 Drafted in the third round by Los Angeles in the 2016 Draft, May has breezed through the Dodgers' system en route to becoming their top pitching prospect. In his three years in the Minor Leagues, May has posted a 3.55 ERA along with a 4.73 K/BB ratio and notched the victory for the Drillers when they clinched their first Texas League championship in 20 years last season. Los Angeles' No. 27 prospect Cristian Santana lined an RBI single in the first for Tulsa. Fourth-ranked Gavin Lux picked up two hits, an RBI and a run, while Chris Parmelee and Zach Reks crushed solo homers for the Drillers. Arkansas provided some late-inning theatrics, though Fraley bashed an RBI triple in the ninth to tie the game, 3-3, and came around to score on a single by White. Lux tied the game with an RBI double in the bottom of the ninth, but a sacrifice fly by Jordan Cowan off lefty Adam McCreery plated the go-ahead run for the Travelers. They tacked on an insurance run when third baseman Santana's throwing error enabled Mariscal to cross the plate.